It’s a happy accident that I was born in France. Wait, that’s not right. What I should say is that it’s a happy accident that I was born to a mother who was born in France. Yes, that’s better. When we first came to the states, my mother was learning to speak English with help from Darrin and Samantha, Pa, Little Joe and Hoss, and even the Skipper and Gilligan, not to mention the misfits over at Days of Our Lives. But it was Granny, Ellie May and Jethro who gave her accent that American twist, plus the fact that we were in Texas at the time. Listen, when you first hear a French accent with a Texas twang it’ll stop you dead in your tracks and make you shake your head like a dog with a foxtail in its ear. Luckily for everyone’s auditory senses, we quickly moved on to California and the accent went back to basic French. But as my mother was learning English, she was still cooking French. While the kids next door were eating fish sticks, we were feasting on Coquilles St. Jacques in real scallop shells. 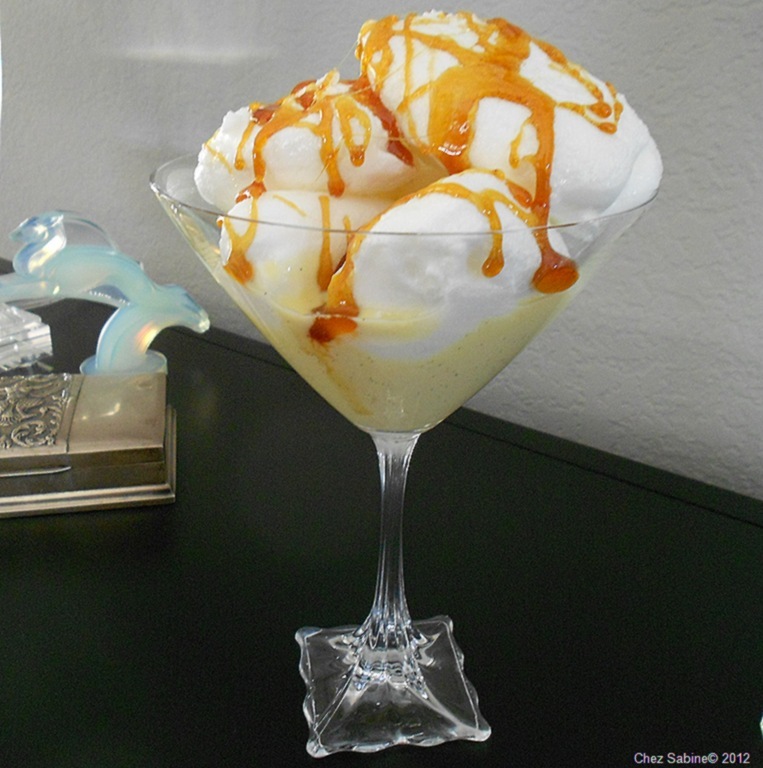 And when they topped off their dinner with Jell-O and Cool Whip, our spoons were breaking through brittle caramel to make their way to the pillows of meringue lollygagging on pools of crème anglaise that made up oeufs a la neige. Loosely translated to snow eggs. She’d whip up those meals like other mothers would put together meatloaf and chocolate pudding. That’s just the way it was. We didn’t know any better at the time. These days, when I see oeufs a la neige on a menu, I feel as if I have a secret. It comes off as a fussy dessert, but it’s really not. It’s made up of three simple components: poached meringue, crème anglaise (vanilla custard sauce) and melted sugar caramel, with ingredients most people keep on hand. The result is a comforting mouthful. You can make the meringues and the crème anglaise ahead of time, but the caramel has to be done no more than an hour or two before serving. And if you live in humid climes, then you might want to keep it to only an hour because humidity will liquefy that beautiful caramel garnish, and pretty much ruin the look of your dessert. It will, however, still taste fabulous. And should you have leftovers (my breakfast of choice to this day), then you’ll get to savor a special version when the caramel has melted and drifted to the bottom of the custard, and you’re left with flavors reminiscent of flan. But better somehow. Before I get to the instructions and recipe, we need to discuss the difference between oeufs a la neige and floating island or île flottante , which you’ll also see on restaurant menus. They are essentially the same dish, with a slightly different presentation. Please, let’s not argue about this. Sometimes you’ll find the meringue in floating island baked in a loaf pan or even a tube pan and sliced, then served on a pool of the crème anglaise, with the sticky caramel drizzled on top. 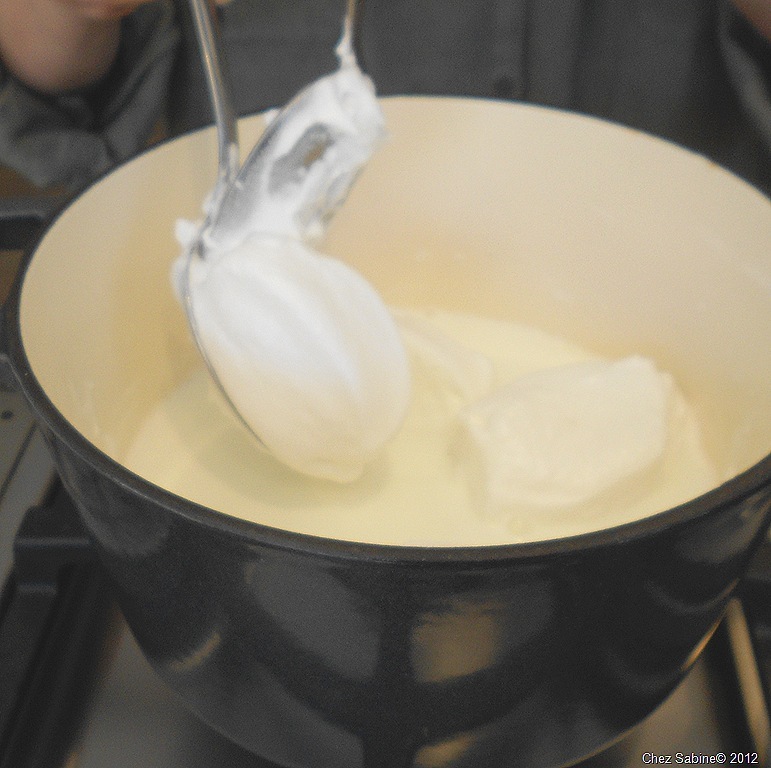 The meringue in oeufs a la neige are poached in milk (sometimes water, but I only use milk, and you should, too). At times you’ll find both of these served without the sticky caramel. That’s just so wrong it makes my palms itch. Why that’s like serving a hot fudge sundae with vanilla ice cream, some whipped cream and a cherry – the end. So, oeufs a la neige, floating island or île flottante — call it what you will, it’s delicious, impressive, not impossible to put together, and you need to make it. The ingredients are simple. 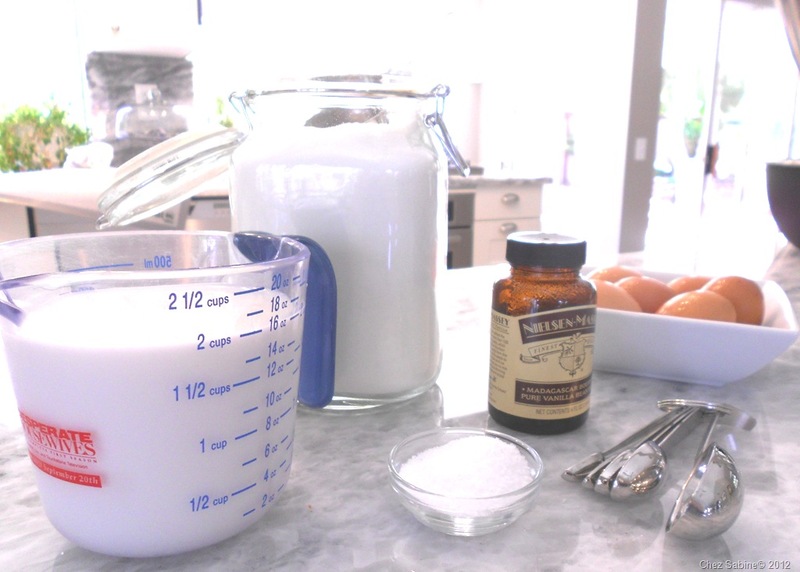 Whole milk, sugar, vanilla paste (or a bean or extract – not imitation, please), a half-dozen eggs and a little salt. First, separate your eggs. I use my hands. Then place the whites in a medium mixing bowl. Here’s a tip: Don’t put your egg shells in the garbage disposal. It’s not the crunchy shells that gum up the works, but the stringy membrane found between the egg itself and the shell. That stuff that makes peeling a hard-cooked the most tedious chore at times. Bring your egg whites to room temperature before you start whipping them. If you don’t know the drill, here it is: Make sure there is no yolk in your whites and that you have a perfectly clean and dry bowl without any trace of oil. 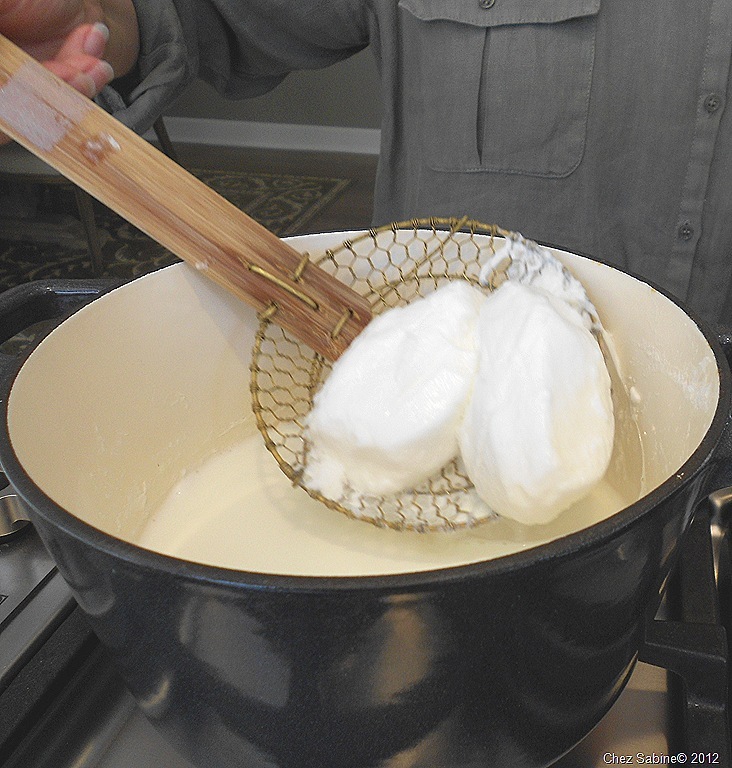 You want plenty of foamy egg whites, and yolks and oil or fat interfere with the process. 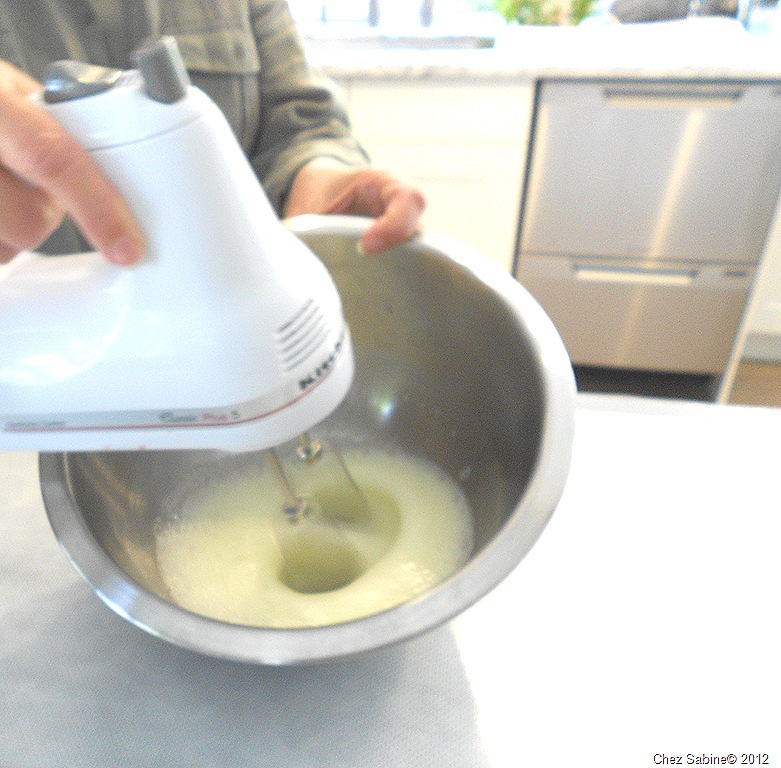 Add your sugar to the egg whites a little at a time when they start to form soft peaks. 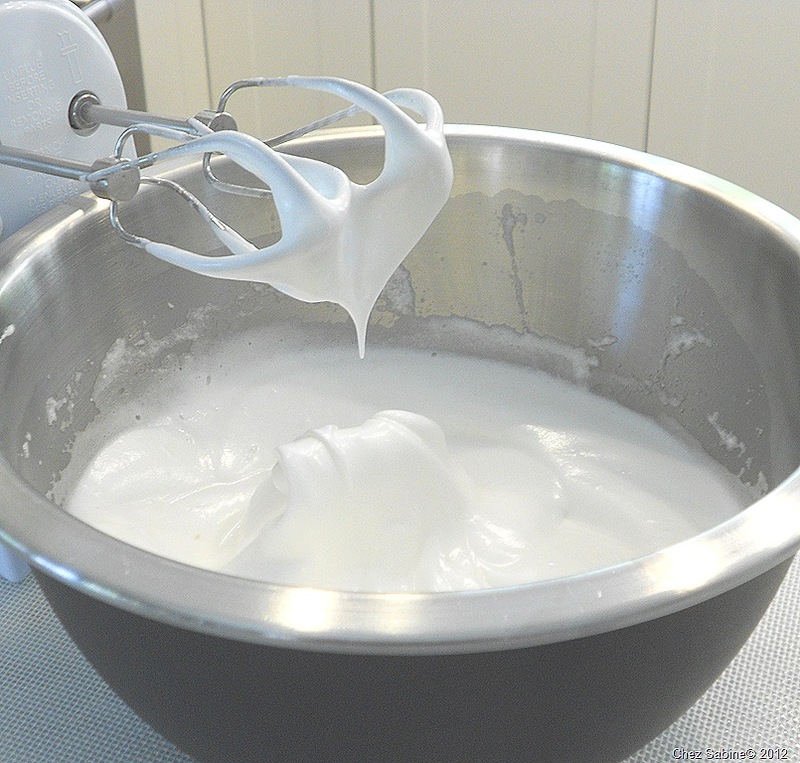 If you add it too early, then it’ll take much longer for your egg whites to come to stiff peaks. We’re all about stiff peaks here. Look how beautiful and glossy these egg whites are. All of the sugar has been added. Now we can call this meringue. 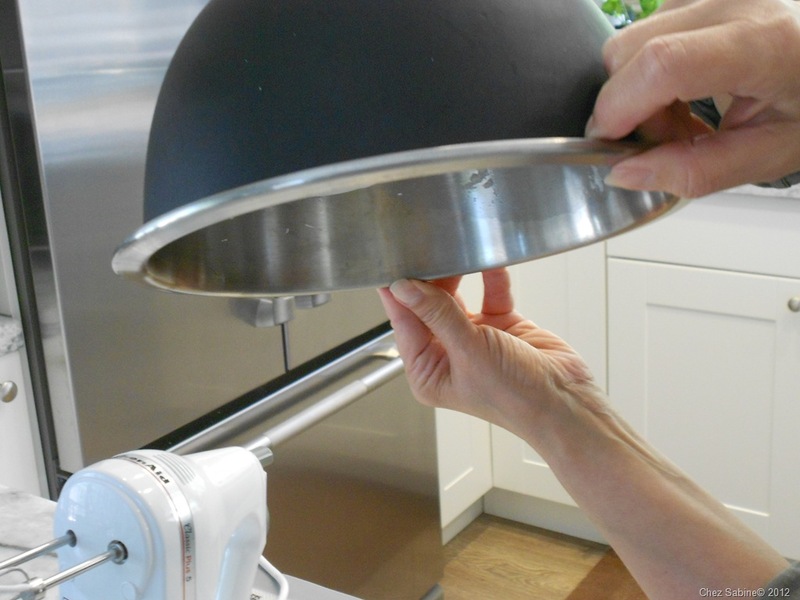 And you should be able to turn the bowl upside down without losing a speck of meringue. Try it. 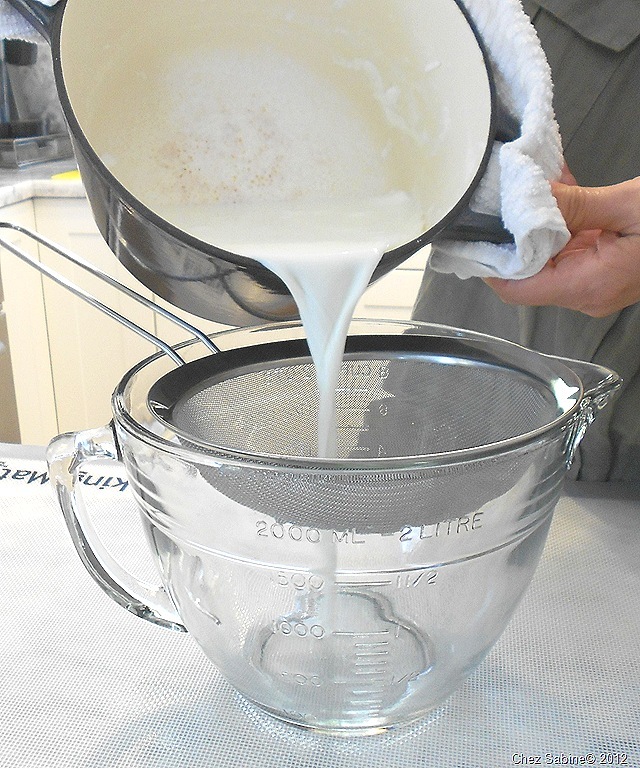 While you’re finishing beating the meringue, start heating your milk in a heavy bottomed pan. You want the milk to start getting bubbles around the edges, not a rolling boil. 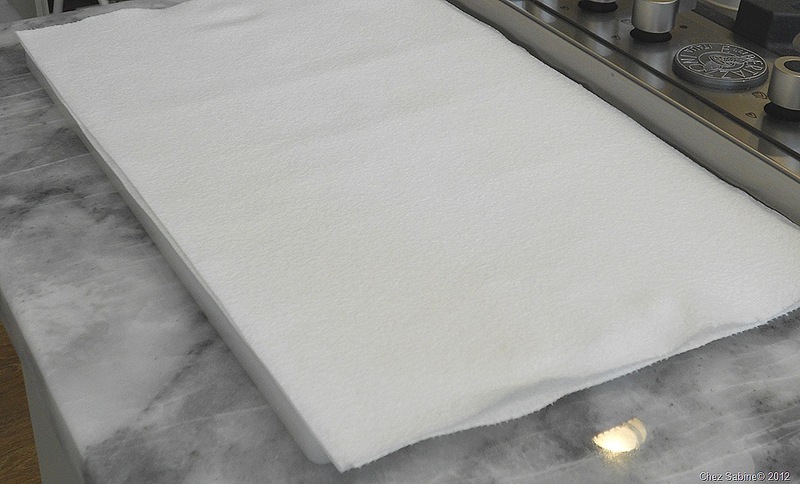 I like to place a large cutting board covered with several layers of paper towels next to where I’m poaching the meringues. You could replace the cutting board with a cookie sheet or jelly roll pan. 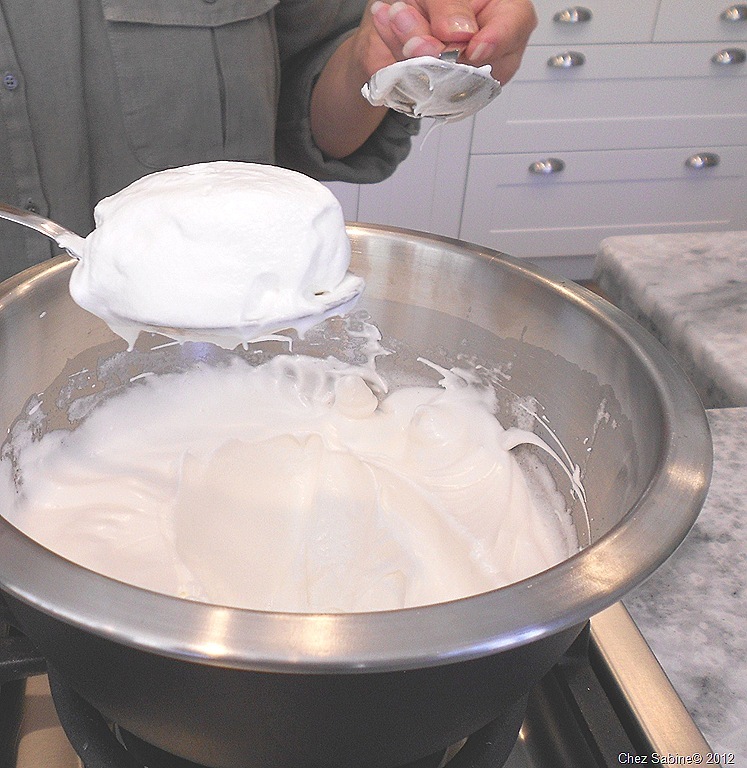 I’m using a fairly deep pot to poach my meringues, but you might find a shallow skillet easier when it comes to being able to add more meringues and to flip them over. That blue thing of the floor is one of Dexter’s toys. In case you were wondering. 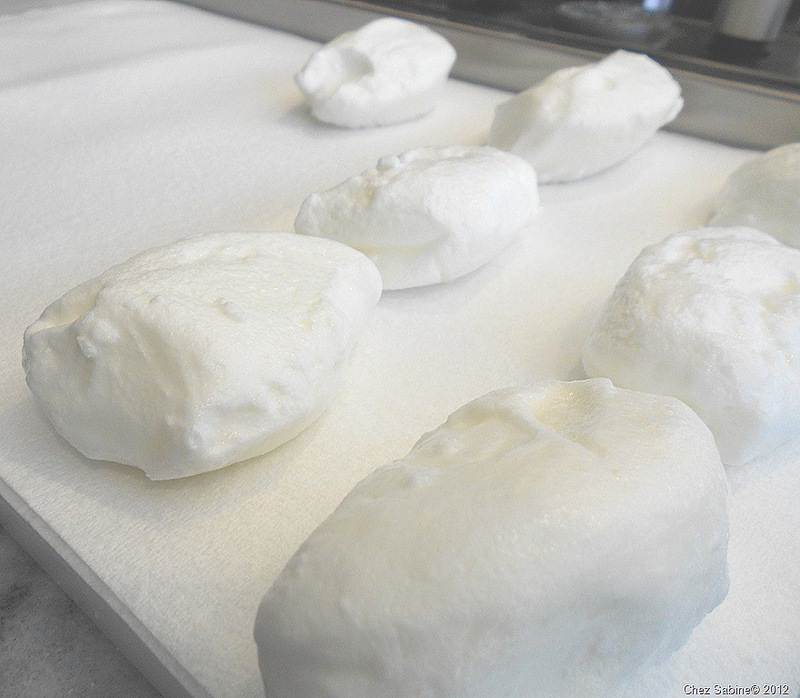 Once the milk is hot, it’s time to start making the meringue eggs. I use two soup spoons to form the eggs. 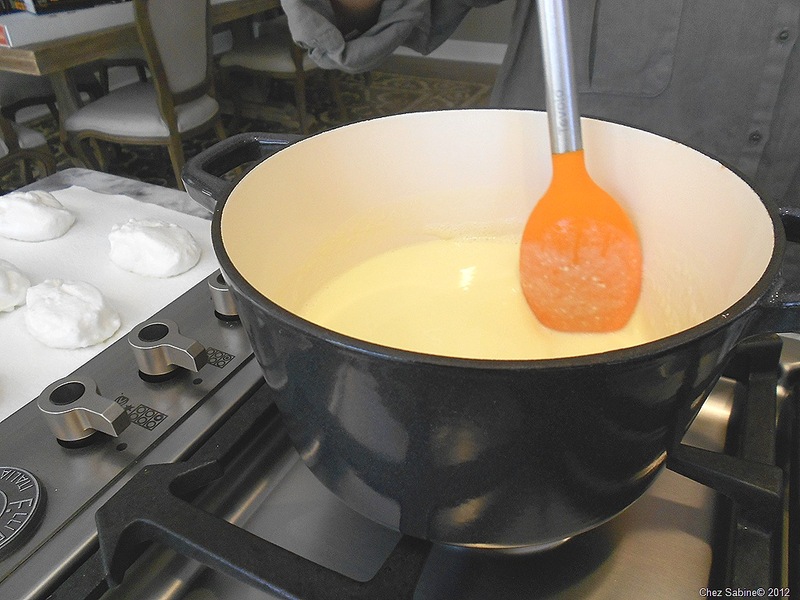 Gently slide the eggs into the hot milk and poach each side for about two minutes. Flip them carefully because they’re pretty delicate at this point. 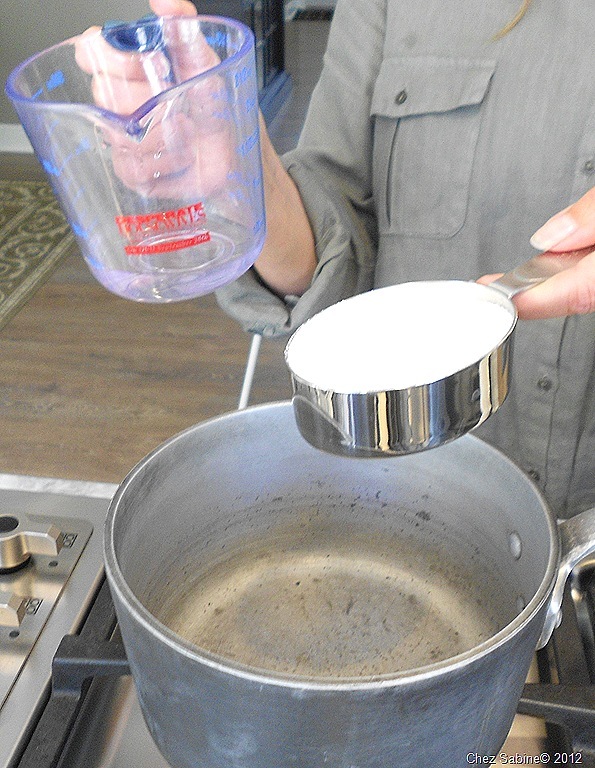 If the milk develops a skin as you’re poaching, just carefully reach in with a fork and remove it. Don’t crowd the eggs or you’ll end up beyond frustrated when it comes to flipping them over. 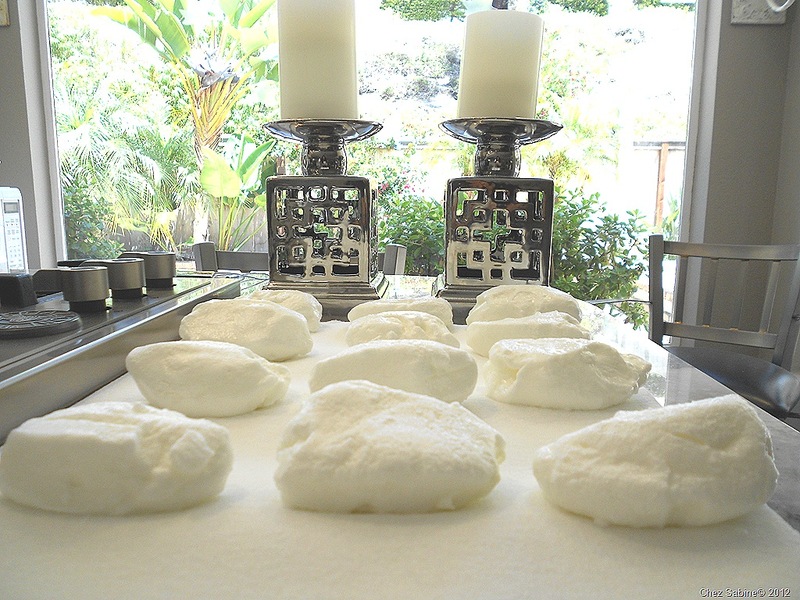 I use a Chinese spider or strainer to remove and drain the meringues before placing them on the paper towels. You can find these pretty inexpensively at most Asian markets. I’ve had this one for more years than I can count, and it’s one of my favorite kitchen tools. Once they’ve been poached, the meringues can be picked up carefully with your hands. They’re not as delicate as they seem. It’s actually the best way to move them around at this point. Aren’t they pretty? Still treat them with care, though, these aren’t crunchy baked meringues. 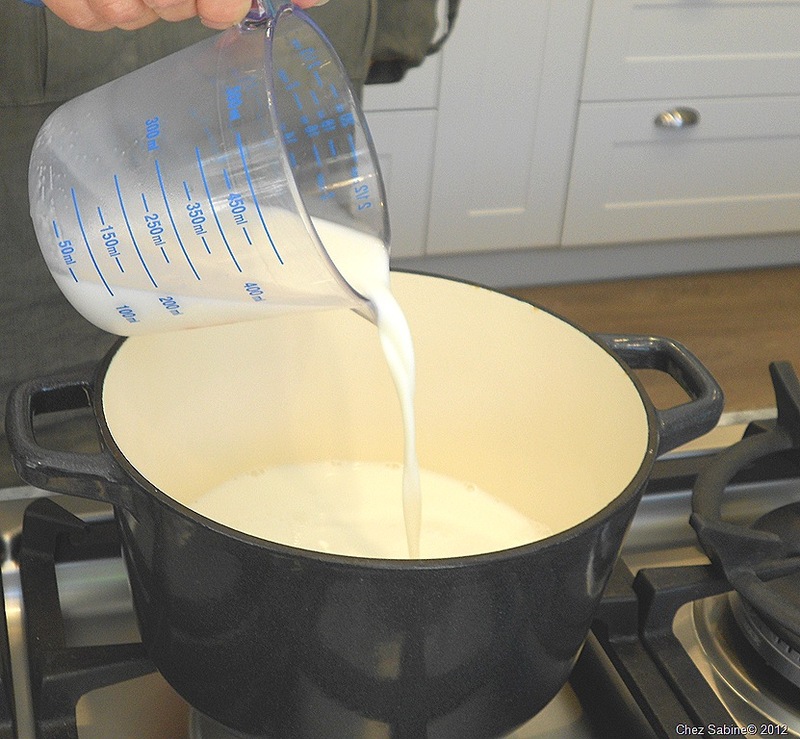 Once all of your meringue eggs have been poached, it’s time to strain the milk, then make sure you add more to make 3 cups. 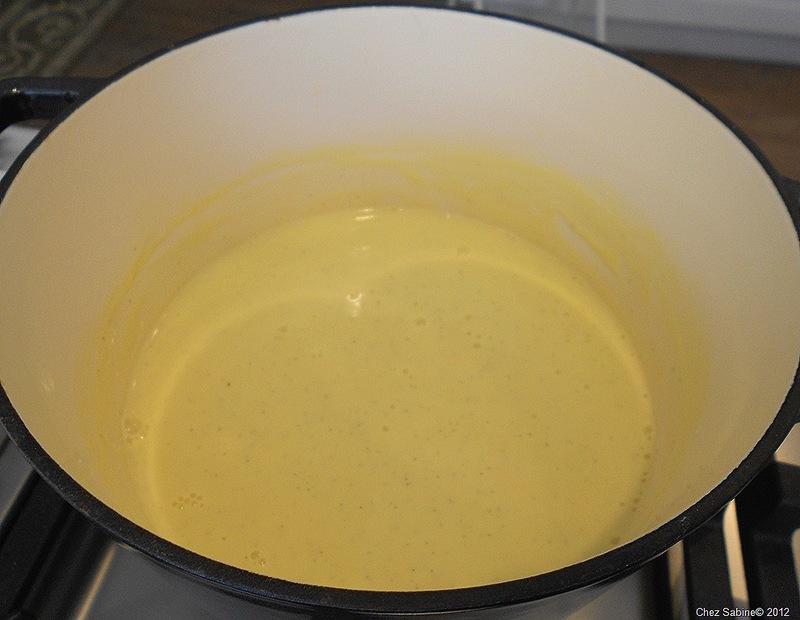 You’ll want to use a pan with a heavy bottom to make the crème anglaise, so if you don’t have another one, make sure you wash the one you used for poaching because you can’t make the custard sauce in a pan that might have bits of scorched milk on the bottom. Grab those egg yolks and whisk them for a few moments, then you’re going to temper them. 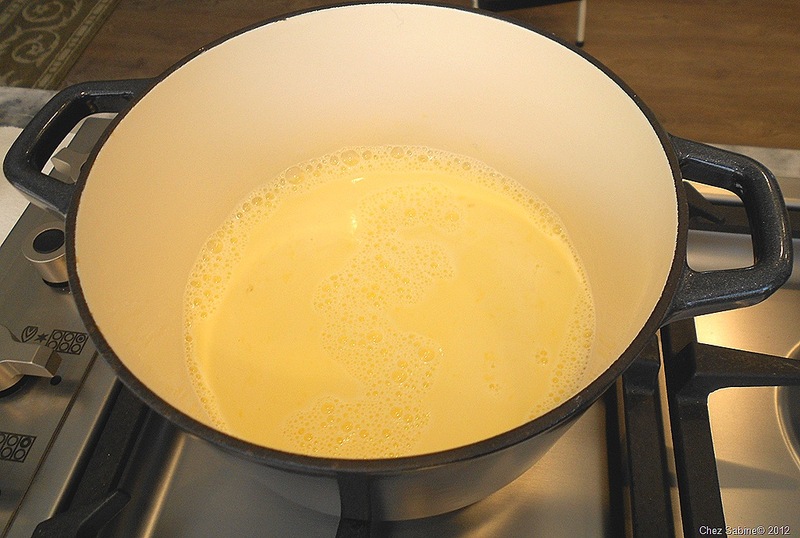 This means that you’re going to add a bit of the hot milk to the yolks and whisk them before adding the mixture to the milk. 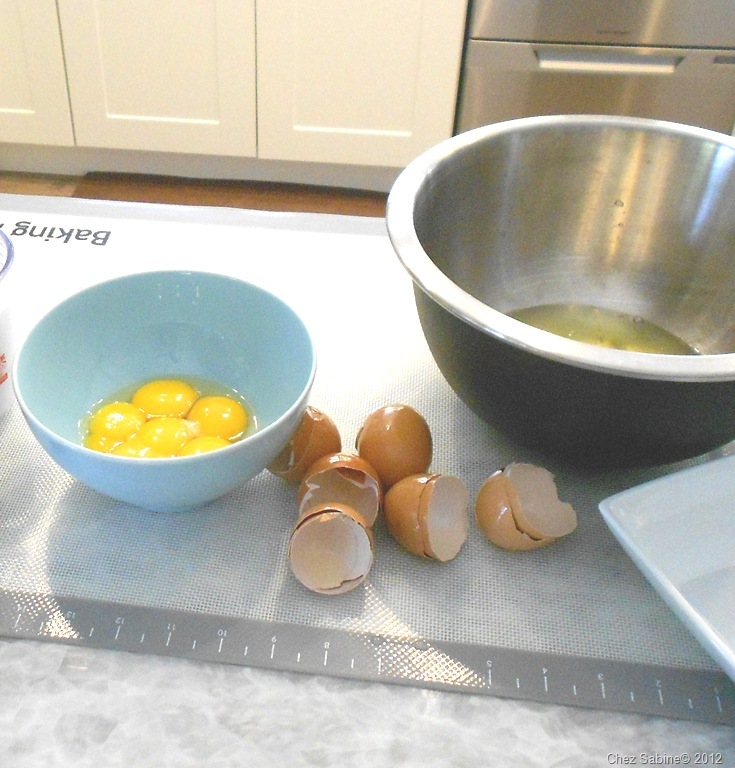 If you just throw in the yolks without tempering, then you risk scrambled eggs. That’s the bane of crème anglaise. 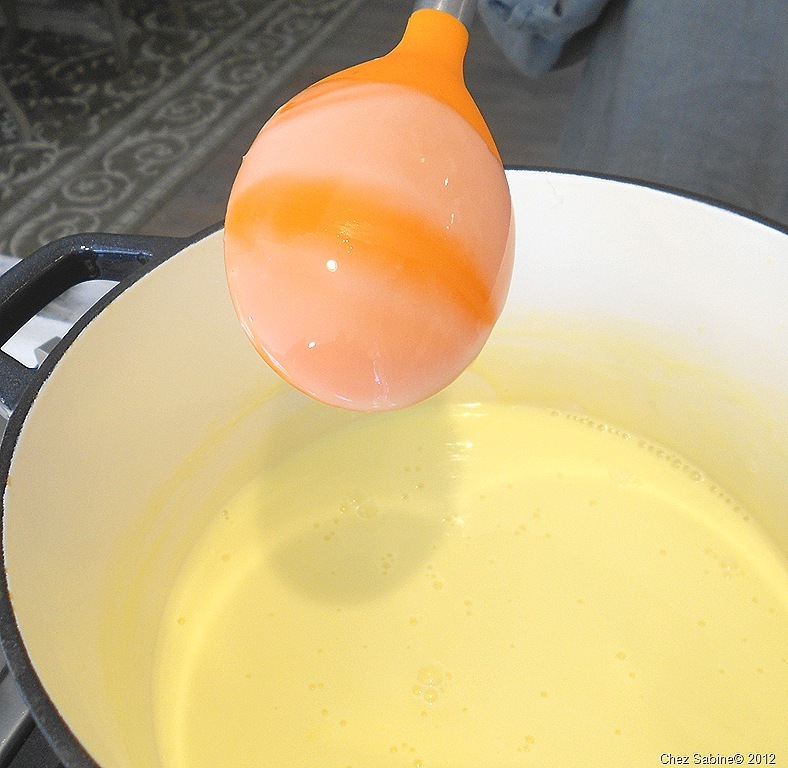 I usually add about 1/3 of a cup of the hot milk to the beaten egg yolks to temper. 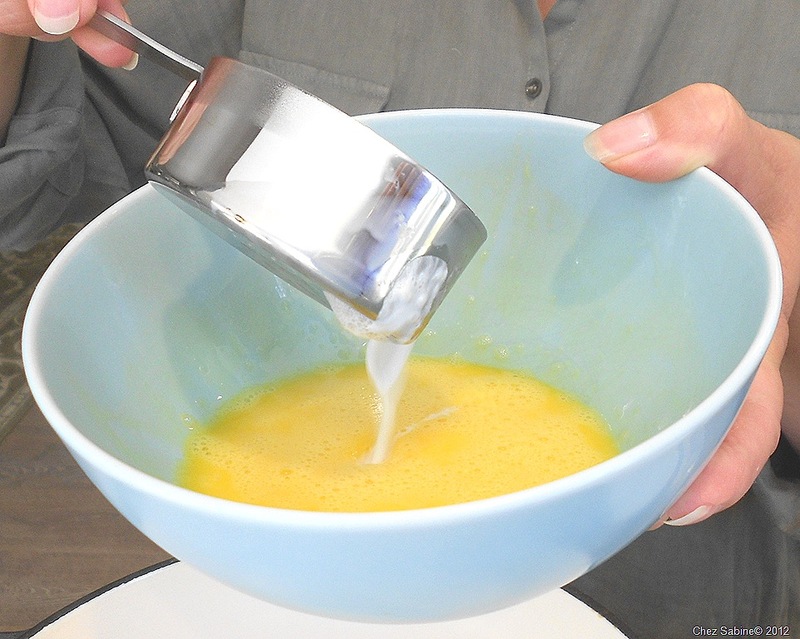 After you add your eggs, your mixture will be very thin. This part takes a bit of patience because there’s a fine line between crème anglaise and a curdled mess. Don’t try to rush the process by turning up the heat. You’ll be sorry. I know, I’ve done it many times. I’ve learned my lesson and now keep it low and slow for perfect results. See the back of that spoon? 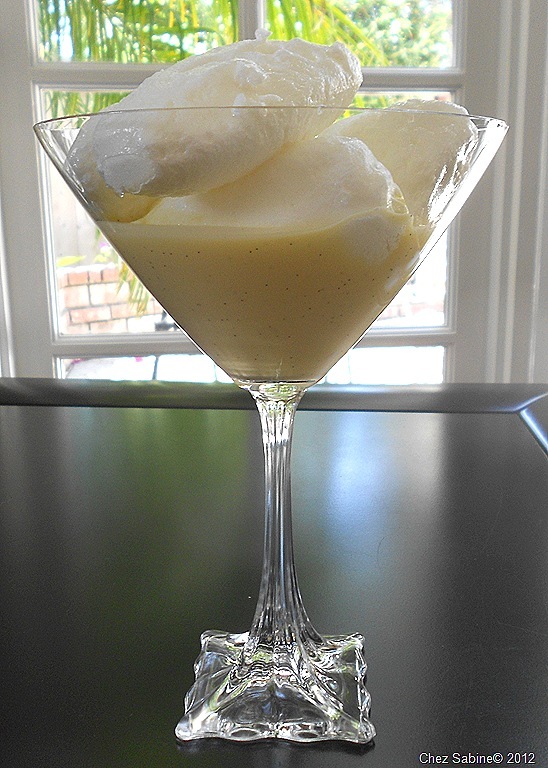 Curdled crème anglaise. Not pretty and hard to salvage. You can try to strain it but it won’t be as silky smooth as you want. Just do what I did, crack some more eggs and start over. And I didn’t rush this, but I’m placing the blame on this stove, which I’ve never used for crème anglaise before. It’s a powerful rascal, even on low. The sauce is done when you can draw a line on the spoon and the liquid doesn’t run together. This is a sauce, not a pudding and it’s supposed to be the consistency of heavy cream. It’ll thicken slightly when it cools. To me, this is simply one of the most perfect sauces ever. A word about the vanilla. When I make desserts, I often prefer to use Nielsen-Massey Madagascar Bourbon Pure Vanilla Bean Paste. It gives me the flavor and the look of vanilla beans without the hassle of steeping and then scraping the vanilla bean. The paste is loaded with tiny vanilla seeds and you simply substitute equal amounts of paste for extract. I think it has a much better vanilla flavor than extract that sometimes is overpowered with alcohol. Look closely and you can see that the crème anglaise is studded with vanilla seeds. The caramel is easy but you have to watch it. Take it off the heat too soon and you have a pale, bland drizzle. Leave it on too long and you end up with a bitter mess. 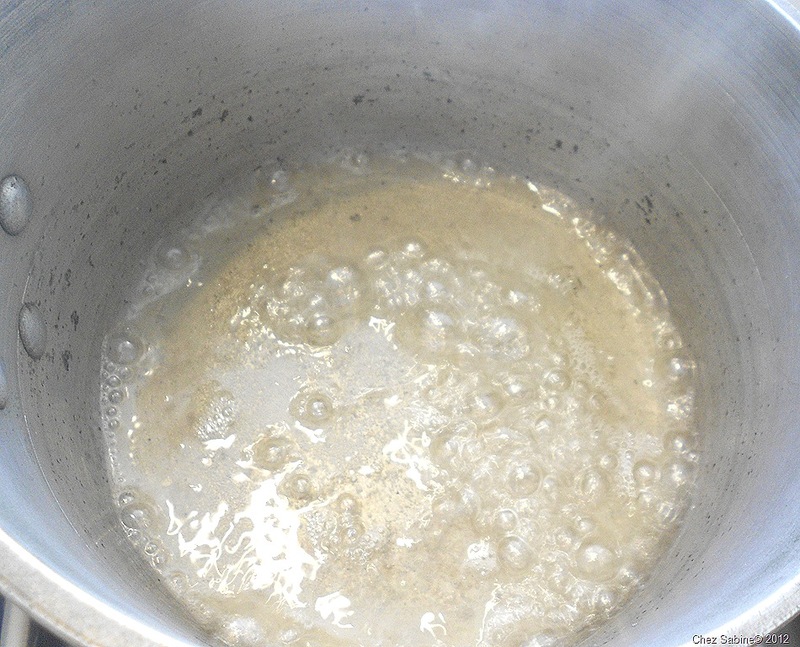 Place water and sugar into a heavy bottomed pan and let it come to a boil. I leave it alone until almost the very end. After a few minutes, you’ll notice the sugar start taking on a little color. 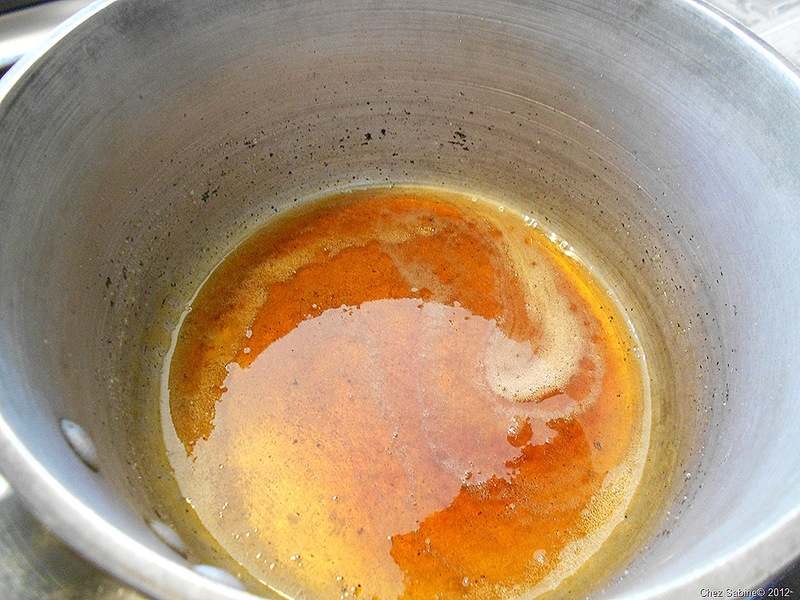 When the water has boiled away, the caramel will stop bubbling and darken pretty quickly, and that’s when you can’t take your eyes off of it, not for a nanosecond. Now it’s perfect and it won’t wait for you. It’s ready and you need to have your eggs and snow in place. You can pour the crème anglaise in a large bowl and pile the meringues on top, then drizzle the caramel, or make individual servings, which makes for a swellegant presentation for guests. Oh, and be careful with the caramel. A burn could very well send you to the emergency room. I use wine glasses or, as in this photo, fun martini glasses. 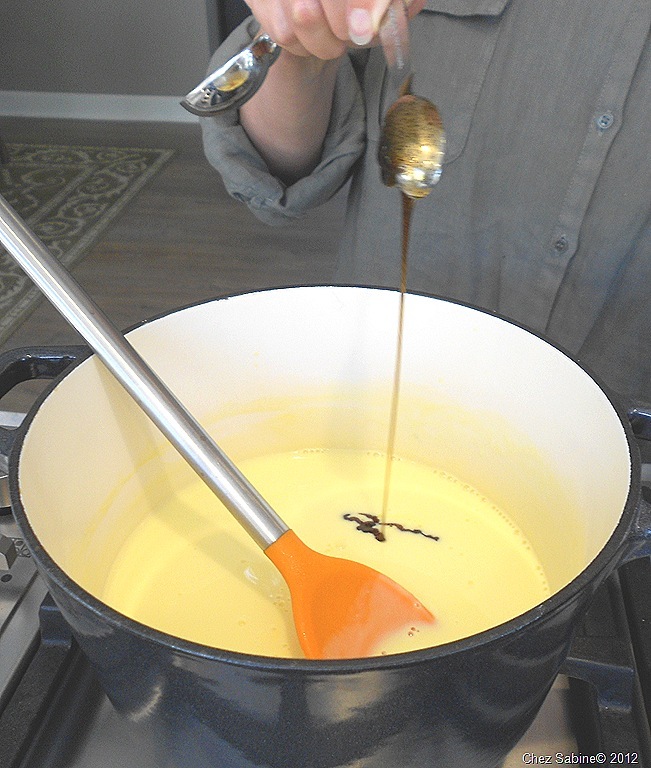 You can make oeufs a la neige ahead and keep them refrigerated at this point, and the caramel can be prepared just before serving. Check out those vanilla seeds in the custard sauce. And there you have it, a stunning desert with a smooth vanilla-scented crème, airy meringues and a sweet crackle finish. Oeufs a la neige manage to simultaneously offer comfort and elegance. While this dessert sounds complex, it’s really not, but it does involve making and combining three separate components: Meringue, crème anglaise (vanilla custard sauce) and melted sugar caramel. The gorgeous and delicious outcome is worth the effort. 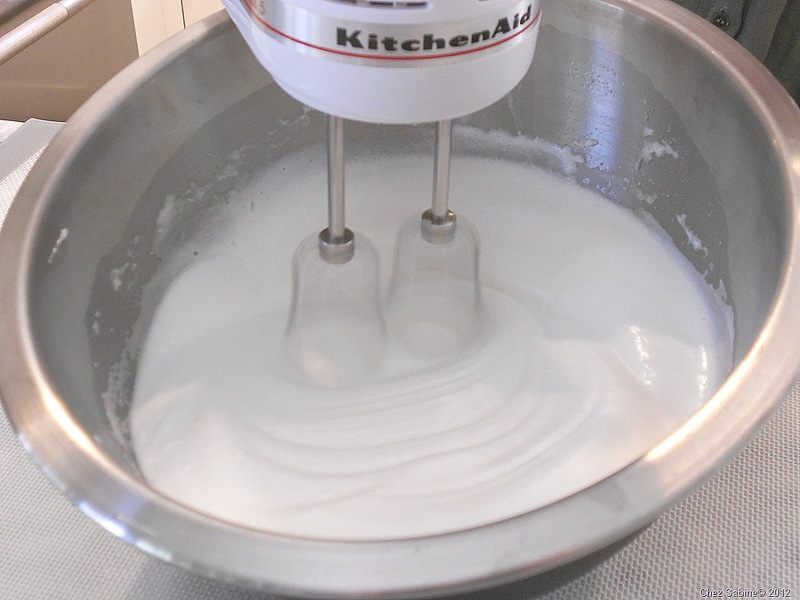 In a large bowl, beat egg whites and salt until soft peaks form. Gradually add sugar and beat until stiff peaks form. 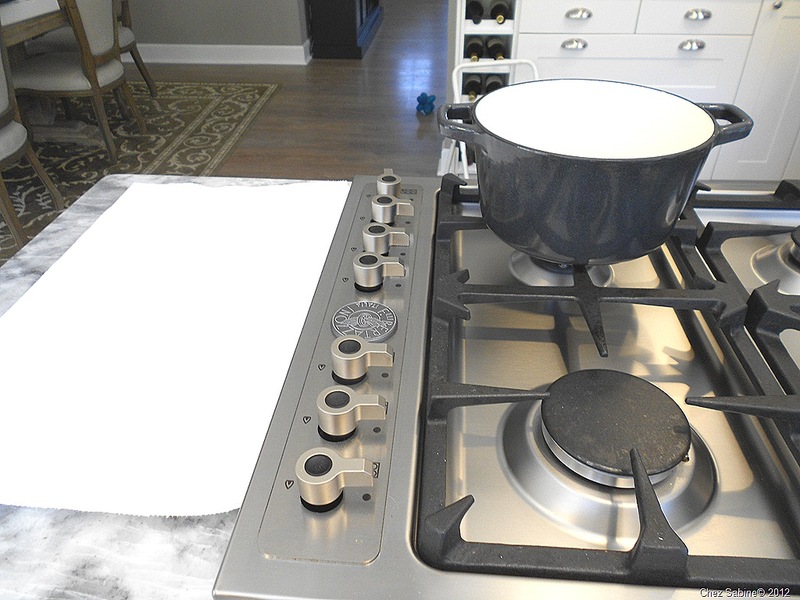 Meanwhile, in a wide, low pan, heat the 2 cups of milk over medium heat until hot but not boiling. With two wet soup spoons, scoop out meringue “eggs” and slip them into the hot milk. Poach about 2 minutes per side. Drain them on paper towels. 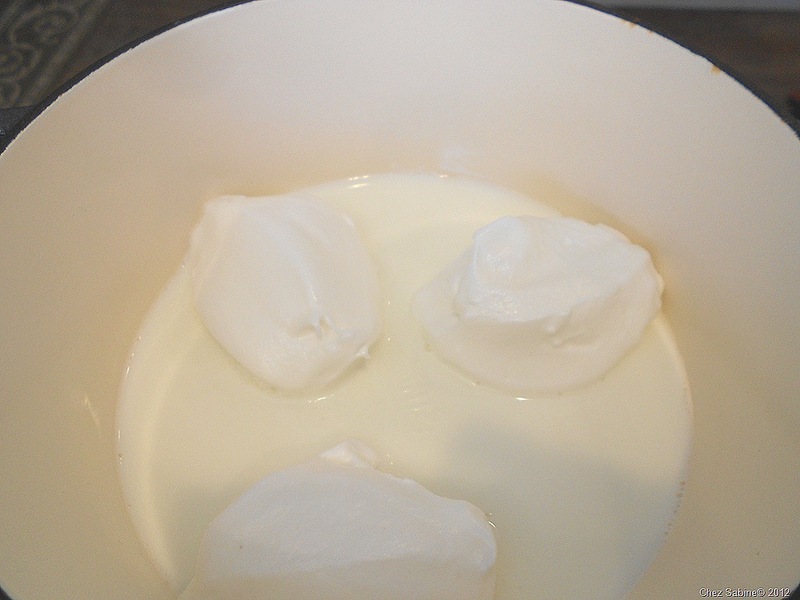 Continue until all of the meringue is poached. 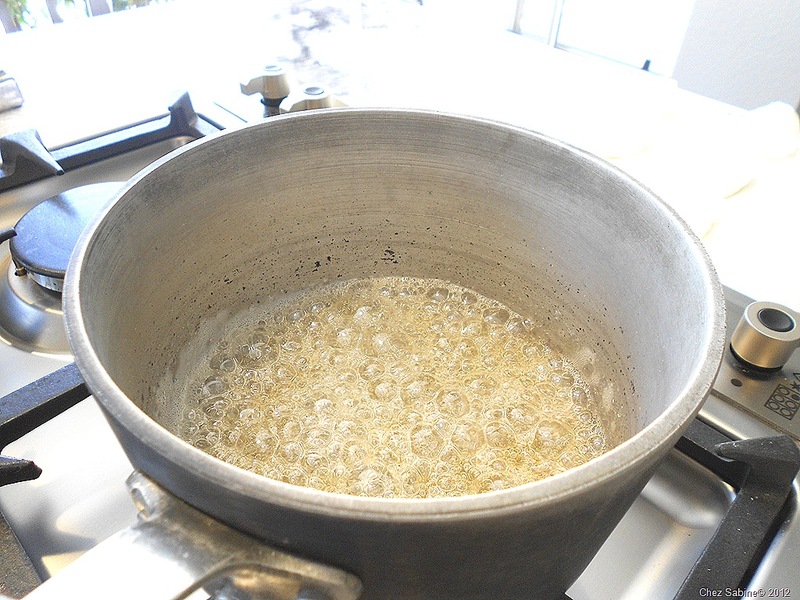 In a small heavy bottomed saucepan, bring the milk and sugar just to a boil. 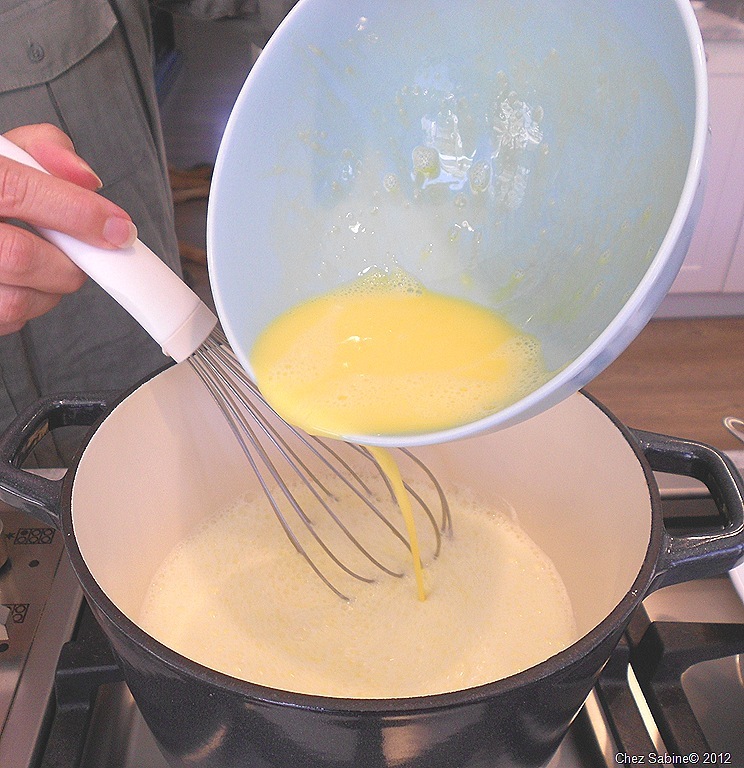 In a medium bowl, whisk egg yolks and add a little of the hot milk to temper the eggs. Keep whisking. 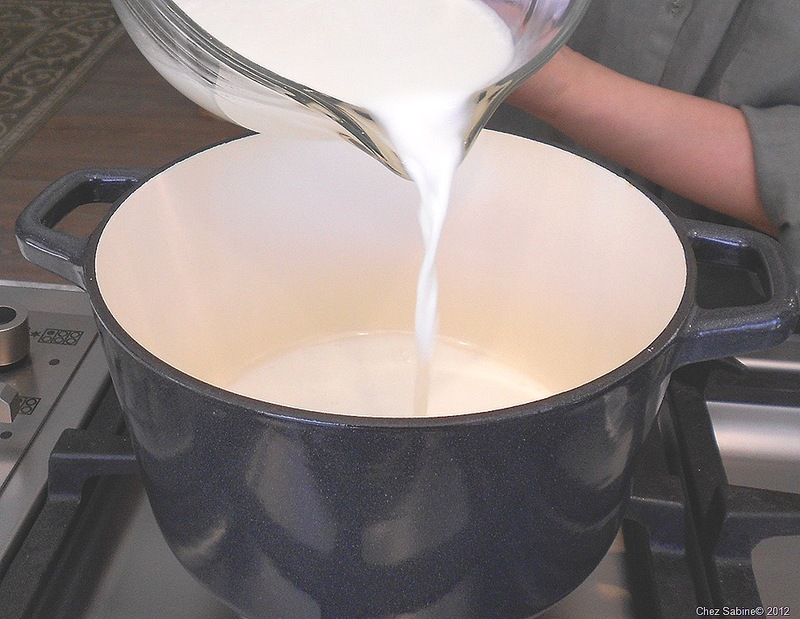 Slowly add the rest of the milk while whisking and pour mixture back into the saucepan, and whisk or stir until the sauce is slightly thickened and it coats the back of a spoon. Run your finger down the back of the spoon and if the two sides of cream don’t run together, then the sauce is done. Do not overcook or you’ll end up with scrambled eggs. Trust me, it can happen in the blink of an eye. When done, immediately strain the sauce and stir in the vanilla. 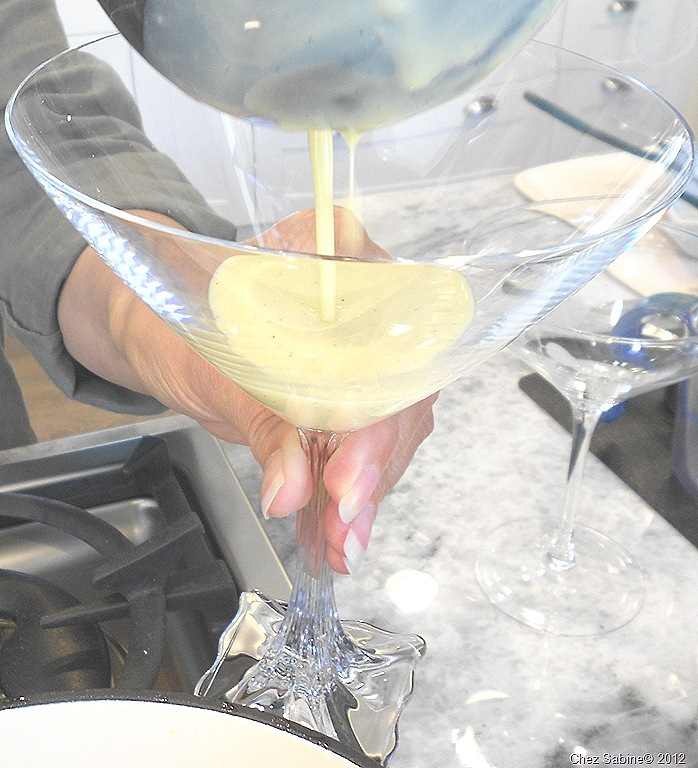 Pour the crème anglaise in a shallow bowl and place meringue eggs on top. Or serve in individual bowls or goblets. 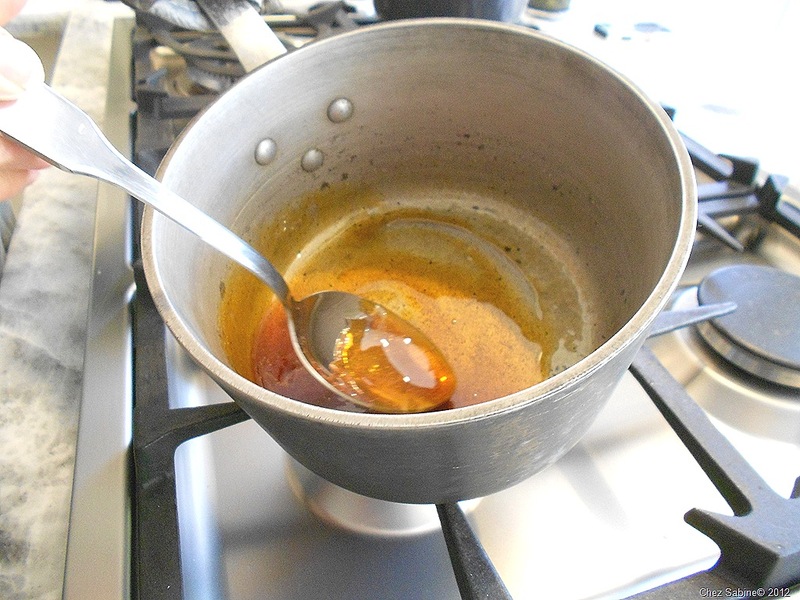 In a small saucepan, dissolve the sugar in the water and boil until it turns a copper color, but not too dark. 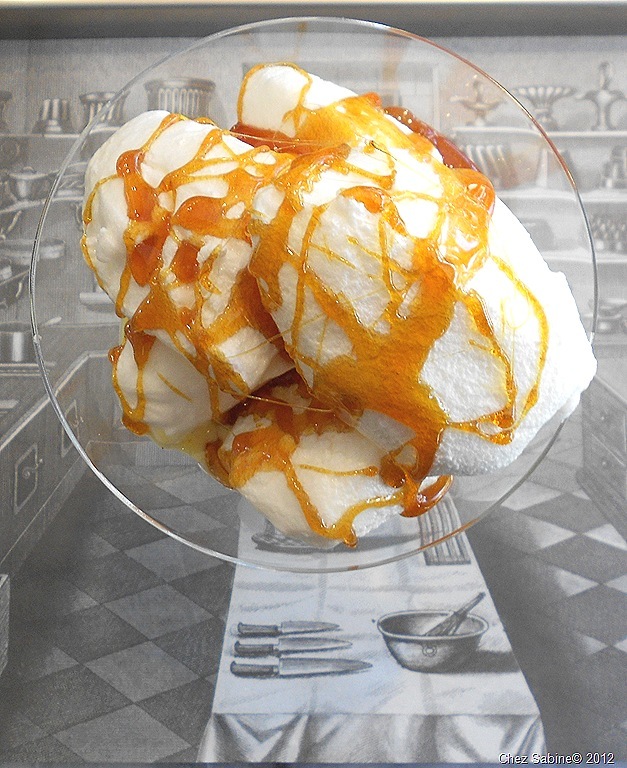 Immediately drizzle the hot caramel over the meringues. Serve warm or cold. Take a look at the video for more details and then please make these and report back. Not complex? You must be kidding Sabine! It looks fab and I bet it tastes great too. Will you make me this dessert when you visit in Atlanta? Marylin, think of it a little like doing your own French manicure versus slapping on some clear polish. There are a few extra steps involved, but it’s not as complicated as applying a set of gel nails nor is it as labor intensive as putting together a three-tiered wedding cake. I’m so happy you’re reading and liking. I’ll make enough so you can have leftovers the next time I visit Atlanta. Absolutely. Please let me know when you will visit the Big A. I know Morieka would love to see you as well. Bonjour Sabine. Although I have dozens of cookery books, your receipe for oeufs a la neige is by far the best and easiest to follow. I did some as an experiment for lunch today before I found your website, but when we have a dinner party in a couple of weeks time I will follow yours. In the first receipe with the photos you did not mention sugar in the creme anglaise, but I see it is in the full list of ingredients. Merci beaucoup. Judith Manners. Staffordshire. UK. Judith, thank you, I’m so happy to hear that. Your guests are going to be so pleased. It’s such a lovely dessert.